We hope you enjoy this A to Z interactive glossary of essential and non-essential barbecue terms (we’ll let you decide for yourself which are which). A BBQ Jew – Dashingly handsome, witty and often seen wearing a grease-stained shirt, the BBQ Jew is a rare breed indeed. On the lam from the kosher law, he is living a life of swine. If you look carefully, you may spot a BBQ Jew at your local barbecue joint washing down a chopped tray with a tall glass of Cheerwine, since it’s the closest thing to Manischewitz available. Barbeco-ed – A woman who shows genuine enthusiasm for, and true appreciation of, barbecue. A sophisticated barbeco-ed is equally at ease in a formal gown as she is wearing jeans and a t-shirt that smells of peppered vinegar. Barbedude – A man who knows the difference between real pit-cooked barbecue and the other stuff, and is willing to tell people why it matters. Much like the pig he reveres, a barbedude may display grunting, snorting or rooting behaviors when he is near a chopped tray. Beer – Beer is surely one of G-d’s greatest creations. In fact, we have confirmed with Jesus himself Moses an old college buddy of our’s that the original text of Genesis 2:2 reads “and on the 7th day He kicked back with a cold brewski.” Nevertheless, we believe that beer (even this beer) has no place in a barbecue joint. Barbecue joints are places of worship; you wouldn’t drink a pint while sitting in a church pew would you? Brunswick Stew – One of the side dishes that distinguishes Eastern style from Lexington style barbecue. 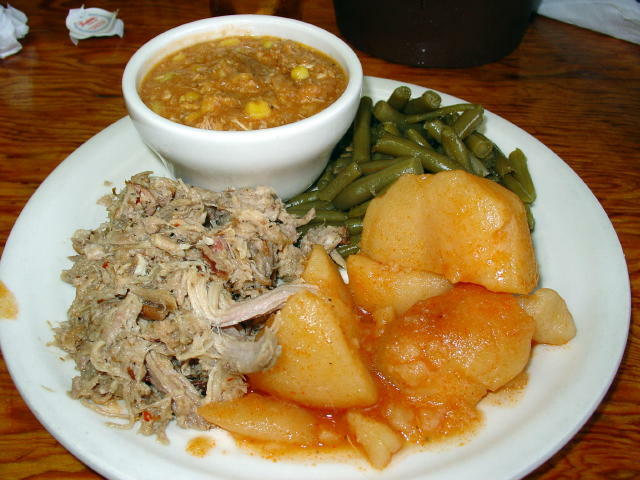 Served almost strictly in the eastern part of the state, Brunswick stew contains at least one (and often two) of the following: pork, chicken, and beef. It also includes some of the following: tomatoes, potatoes, corn, onion, and lima beans. Other vegetables may sneak into the stew too, since some cooks treat Brunswick stew as a bit of a kitchen dumping ground. After all, it originally was made with squirrel. Interestingly, Brunswick stew is not native to North Carolina, as it likely originated in either Brunswick, Georgia or Brunswick County, Virginia. The residents of those two places continue to fight it out, both eager to claim the revered squirrel stew for themselves. Cookout – Yankees do not use the phrase “cookout.” Instead, they use the phrase “barbecue” to refer to the act of grilling anything from chicken to hot dogs to corn. North Carolinians refer to the process of grilling non-BBQ items as cooking out. Yankees host “barbecues,” which are gatherings that feature items cooked on a grill. North Carolinian’s refer to such events as cookouts. In short, a cookout is what a North Carolinian calls a barbecue that won’t feature any barbecue. So, if a North Carolinian invites you to a barbecue you can be pretty confident he is inviting you to a pig pickin’, and if he invites you to a cookout you can be pretty sure he won’t be serving barbecue. This nomenclature avoids confusion and keeps guests from arriving 10 hours early to help watch the pig/drink. Corn Sticks – One of the classic Eastern style sides that joints may offer instead of hush puppies is the humble corn stick. Hush puppies seem to get all the attention, but corn sticks deserve some props too. They are made with corn meal, lard and other goodies and are shaped roughly like a very long, somewhat wide french fry. Corn sticks are first baked and then fried (they’re so nice they cook ’em twice). They taste a bit like the illegitimate love child of a hush puppy, a french fry and a piece of corn bread. Dip – Another word for barbecue sauce, specifically the stuff provided on the table for customers to use. This is the common parlance in Lexington style joints. There is some speculation that it is called dip because it was traditionally (and often still is) served on the side for customers to dip their barbecue into. This explanation isn’t very exciting but it does sound likely. Dip is also the name a waitress will have good reason to call you if you order unsweetened tea at a barbecue joint (e.g., “Hey, dips%*t, order some real tea!”). Eastern style – The type of barbecue eaten (and preferred) by the vast majority of Tar Heels living east of Raleigh. Eastern style ‘que in its purest form is made from whole hog and accompanied by a sauce that is built on a base of vinegar + salt + hot pepper, with no tomato whatsoever involved. This type of sauce is the original barbecue sauce in North America, where colonists originally thought tomatoes were poisonous. Eastern style sauces vary from joint to joint, with hundreds of often subtle modifications of the basic recipe, but they tend not to deviate too far from the traditional flavor. The pig meat is almost always chopped, often rather finely, for Eastern style ‘que. Some classic Eastern style side dishes include creamy white slaw, boiled “barbecue” potatoes, corn sticks or hush puppies or rolls, and Brunswick stew. In our experience, Eastern style joints are also more likely to offer greens (e.g., collards), green beans, potato salad, and even baked beans than are their Lexington style counterparts. Hickory wood – The traditional fuel used for cooking North Carolina barbecue. Hickory imparts a subtle smoky taste to pig that helps make good cooked swine great barbecue. Oak is a suitable and commonly used alternative. Whether Hickory or Oak, the wood stacked outside a real barbecue joint may look like hand-split logs or lowly scraps of wood, but either way remember that wood is good. Note: woods like Mesquite that are used in some forms of non-NC barbecue deliver too potent a taste and are simply unsuitable for NC barbecue. If anyone tells you he has cooked you some Mesquite-smoked North Carolina barbecue, tell him you know just the place he can stick his Mesquite. Honey – What your waitress will likely call you if you are between the ages of 3 and 93. For Yankees reading this website, “honey” is a term of endearment and is NOT a way of disprecting you. We know this level of friendliness may come as a shock to Philadelphians, New Yorkers and others who are used to being insulted by servers. Please trust us. Honey is also the nickname of Wayne Monk, owner of the outstanding Lexington #1 and one of the state’s living BBQ legends. Hush puppy – What Lassie was told the day Timmy drowned in the old well, and also one of the most ubiquitous barbecue side dishes (probably second to slaw). Hush puppies, a fried corn meal delicacy, are not a native North Carolinian dish but have become well-entrenched in NC barbecue culture over the past 70-some years. There is less variation in ingredients and taste among hush puppies than among varieties of slaw, but they do vary widely in size, denseness, sweetness, and some add-in ingredients (diced onions being the most common). We love hush puppies but never understand why fried goodies like hush puppies need to be served with a side of butter or margarine, as is sometimes the case. On the other hand, we do enjoy a bit of honey butter on occasion. Lexington style – The type of barbecue eaten (and preferred) by the vast majority of Tar Heels living in Burlington or further west. It was popularized in Salisbury, Lexington and other towns in the state’s piedmont region. Lexington style ‘que in its purest form is cooked from pork shoulders and accompanied by a dip that is made of vinegar, hot peppers and at least a dab of ketchup or other tomato paste. Additional sugar and a bit of Worcestershire sauce are other common ingredients. It is NOT a dark, gloopy KC Masterpiece style of sauce despite what Eastern style fanatics will tell you. Lexington style dip probably has more distinctive variations from joint to joint than Eastern style sauce, ranging from hot, spicy thin vinegar to somewhat sweet and a just a little bit thick. 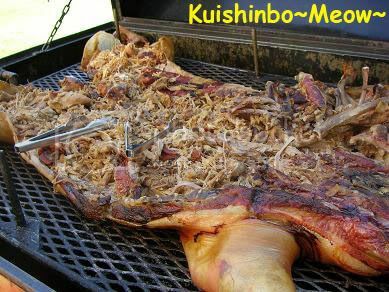 As in the east, it is common for Lexington style ‘que to be chopped but it is also common for it to be served coarse chopped, chunked, or sliced/pig pickin’ style. We recommend sampling each style to find which you prefer, just not during the same meal. Also, Lexington style joints almost always offer a “tray” (‘que, slaw and puppies) in addition to a plate (usually adds fries or another side). Popular Lexington style sides include vinegary chopped “red” or “barbecue” slaw, creamier “white” slaw, and hush puppies. New York Times – A newspaper of modest circulation and influence from a podunk town up north that has for some reason praised North Carolina’s barbecue scene over the years. There must not be many good restaurants in New York. And that is all we can say about New York that’s fit to print. Outside Brown – The flavor-filled outer layer of barbecue produced by the low, steady heat of barbecue cooked over wood. You can ask for a serving of outside brown at some joints (mostly those serving Lexington style ‘que), while others mix it in with the rest of the pork. We recommend ordering a small tray of outside brown (you can just ask for “brown”) and mixing it into a large tray of chopped for the perfect culinary experience. Note that outside brown is NOT at all the same as pork skins. Some folks refer to outside brown as “Mr. Brown” and the rest of the pork as “Ms. White,” but we have yet to work up the nerve to order using that cutesy slang. Pig Pickin’ – Combine a whole hog (traditionally), a homemade metal cooker (preferrably), and a fifth of whiskey for the cook (likely), and you have the basic ingredients for the “pig” portion of a pig pickin’. Invite 50 to 100 of your best friends to tear into the pig once it is cooked and you are “pickin’.” Throw in a bluegrass band and some sides and you are really in business. Warning to vegetarians: We have witnessed a long-time vegetarian from the North get caught up in the local culture at a pig pickin’. By the end of the night, he had helped himself to seconds and was chewing happily on a pig’s ear. This is a true story. Pit – Don’t be fooled by the hell-like fire, a real wood pit is a heavenly thing. It’s the place where the magic happens. Pits used to be dug into the ground, hence the name pit, but are now almost always brick or cinder block rectangles, where coals are set at the bottom and the pig is placed a couple of feet above the coals on a metal grate. Pitmaster – The barbecue equivalent of the chef de cuisine. This is the man (maybe there is a female pitmaster somewhere? if so, let us know!) you should thank for waking up early to slow cook the pork shoulder, hams, or whole hog for hours over wood coals. Note: so-called “barbecue joints” that cook only over gas or electric do not have pitmasters, just plain old cooks. Sauce – In the Eastern part of the state, barbecue sauce is referred to by the surprising name “sauce.” Actually, this might surprise some of the less cosmopolitan interlopers from Lexington used to requesting dip. Slaw – One of the quintessential barbecue side dishes whether one is eating Lexington or Eastern style barbecue, although the former is likely to be of the mayo-free, heavily vinegared and moderately chopped variety and the latter mayo-creamy and chopped to any of a range of textures from superfine to stringy. Eastern style slaw sometimes contains mustard (“yellow slaw”), giving it a somewhat disconcerting yellow hue, while Lexington style slaw often is spiked with dip and/or a shot of ketchup making it reddish in color (and referred to as “barbecue slaw” to distinguish it from creamy slaw). It’s not unusual for Eastern style slaw to contain some carrot and other surprise ingredients, while barbecue slaw is loathe to add such decorative flair. Tea – Ordering “sweet tea” is redundant at the vast majority of self-respecting barbecue joints. Some places have added unsweetened tea to their menus to please the carpetbaggers, but you should no sooner order unsweetened tea with barbecue than brie on a Philly cheese steak. Texas Pete – Very nearly named Mexican Joe (check the Texas Pete website if you don’t believe us), this hot sauce is found at the majority of barbecue joints across NC and is a great accompaniment to the pork for anyone that likes an extra kick of hot pepper. Rest assured that Texas Pete is a native NC product, so no need to feel guilty putting it on your barbecue, even if Carolina Pete would have been more apropos. We always recommend trying barbecue unadorned for at least the first bite, but we do think Tejas Pedro is a worthy flavor enhancer when used in moderation (and a stellar flavor concealer should you stumble stunned upon some subpar swine). The Bermudacue Triangle – Extending roughly from Wake County west to Orange County, this part of the state is where many of the rigid distinctions between Eastern style and Lexington style disappear. It is also a part of the state short on native North Carolinians, who have disappeared in part (presumably) because of the relative dearth of good ‘que. Still, in some cases (e.g., Allen & Son’s) the Bermudacue Triangle is a good thing–free from barbecue dogma, barbecue thrives by combining the best of both NC BBQ traditions. In other cases (e.g., Red, Hot & Blue), the lack of clear barbecue traditions leaves room for imitators and phonies who serve bland ‘que that does a disservice to the state’s barbecue culture. Vinegar – Vinegar is to barbecue sauce what flour is to bread. Basic cider vinegar or white vinegar–usually the former–is the key ingredient in sauce. This holds true for both Eastern style sauce and Lexington style dip. Vinegar is also the duct tape of the kitchen. It can be used for just about anything, from cleaning your counters to tenderizing meat (of course, barbecue cooked for 10 hours needs no tenderizer). If you don’t like vinegar, you probably won’t like real NC barbecue. But you should try it anyway just in case. Yuppiecue – Whereas a true barbecue joint sticks to the basics (pork, chicken, hush puppies, slaw, stew, etc. ), a yuppiecue restaurant’s menu bears more than a passing resemblance to the pages of Gourmet magazine. The Barbecue Joint in Chapel Hill, The Pit in Raleigh and other yuppicue hot spots offer menu items featuring tell-tale phrases like: vegetarian, demi-glaze, baked, herbed, imported, and locally grown. Granted, some of these places may serve decent barbecue but we prefer to stick with joints that are more comfortable in their own skin and see no need to be all things to all people. This is, of course, a narrow and fundamentalist view of BBQ but we need to have some convictions to maintain our faith. Z – We can’t think of any Z words that are relevant to barbecue, but we promised an A to Z glossary and that is exactly what we have provided. Think of us as the U.S. Postal Service of BBQ lingo. Through rain, snow, stormy weather or a Z-word drought you can count on us to deliver, even if what we deliver is mostly junk. LOL at Yuppiecue! You speak the truth, BBQ Jew!!! Regardless, I’ll keep trying new places and return to local good ones (I live in Durham) and just like the rest of your site, your reviews are very good too. I will end with this, I clicked on BBQ Dave and it wasn’t what I expected. I said what the heck and clicked on the video. My heart went out to Micah, what a great kid (and video). I will do all I can to help pass these two bills. Thanks, Barbedude, those are very generous words and we appreciate them. Let us know if you stumble into any new ‘cue joints or other fun facts we should know about. As for the comments on Bullocks, I agree 100% with the comments. “C” rated cue and overcooked Southern food. It amazes me how many “traveled” folks like it. Now if you really want a large menu and really good cue, the next time you’re forced to travel to Charlotte, stop at “Winks” in Salisbury. Close to I-85, I had some sliced cue that was simply outstanding. They even had homemade pimento cheese. Just say no to fast food! sauce that was just bad (one reason I like Mr. Monk’s cue is there’s a lot of vinegar in his dip) and I’ve had Eastern cue that was fabulous. My favorite so far is in Ayden. Chopped is all you can get but on my first visit it was absolutely fine cue with a glorious flavor. On my second visit the young man chopping the meat must have been a little too inattentive as I had a lot of bone in the meat; it still tasted good but was hard to enjoy. Anyway, there’s good and bad on both sides; just remember, it’s always better when cooked over wood. I’m not Jewish, nor do I play one on TV, but I am a transplant from Long Island (c.1981, maybe “transplant” is no longer accurate) who’s loved southern cooking as soon as I arrived. And so do many of my Jewish friends here as well. Your definition of cook-out is very good. Perhaps you should add “grillin'”? I use “grillin'” for what you call cooking on a grill, unlike my northern relations who insist on using “barbecue” when we all know that word is about one thing – pig. Lookin’ forward to checkin’ in from time to time. Love your website. One correction though. Lexington Red Slaw’s key ingredient is not ketcup but dip, which has some ketcup in it. Red slaw is hotter than eastern cole slaw. A favorite anecdote for you: I attended UNC in the early eighties and lived in the ZBT house. (predominantly jewish fraternity for the rest of the goyem, i.e. gentiles) One of our biggest parties every year was a real pig pickin’ prepared by the family of a goy brother from Roxboro. It was great Que and fun to watch the freshman jewish brothers who’d never eaten pork before in their lives taste the forbidden fruit. They were usually first in line the next year. I really enjoyed the entire blog and think that you guys hit the nail on the head with BBQ culture. My grandfather was both owner and pitmaster of Becks BBQ in Lexington back in the seventies and still continues to this day manage to turn at least two of my art school veggie friends into carnivores every year. I recommend the next time you are in Lexington to try Backcountry BBQ on Linwood/Southmont road. Wash it down with the banana pudding. Substantially, the post is really the sweetest on that precious topic. I match in with your conclusions and definitely will eagerly look forward to your coming updates. Simply just saying thanks will not just be sufficient, for the excellent lucidity in your writing. I can at once grab your rss feed to stay abreast of any updates. Genuine work and also much success in your business efforts! food warmer, that is one of the best spam posts I’ve ever received, well done. You nailed it – excellent summary of NC bbq. My mother was from Spencer, so I grew up on Lexington bbq – and you are right that its sauce bears NO resemblance to KC Masterpeice, etc. I can add one piece of terminology – in Rowan County, “barbeque slaw” was sometimes called “hot slaw.” Ths was confusing because in Catawba County, where I lived, hot slaw was a cabbage dish cooked on the stove with milk added. nice website. I’ll keep it as a favorite. While nowhere nearly as humorous as yours, I did try my hand at a BBQ glossary list. Thanks Kevin, your list is well done… but hopefully your steaks are medium rare. Hmph! So the Jew THINKS he knows Sauce huh? NOT SO! I, the greatest and most awesomest bbq sauce maker and purveyor East of the Mighty Mississip have the best, the most awesomest, tongue tingling, eye ball poppin, larrupin good sauce ever…ever…ever…Y’all hear me? huh? huh? huh? Here’s a “Z” word for you. Zagat. A restaurant review conglomo that has rated the best BBQ joints in the country. They got K.C. right, so I figure that they might know what they’re talking about.